Slowly, perhaps near a walking pace. Edith Channel could have kept up with those wagon trains. 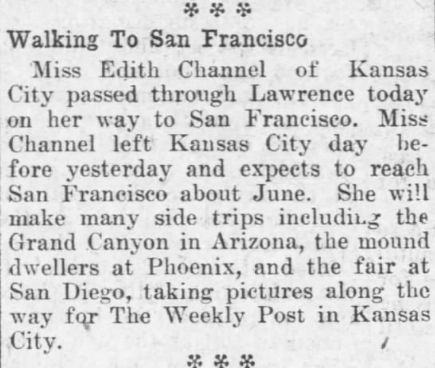 Miss Edith Channel, a Kansas City stenographer who is walking from Kansas City to San Francisco, arrived here last night and this morning left for Pawnee Rock. She is making the journey without funds other than what she earns on the way through selling subscriptions to Our Country, the weekly edition of the Kansas City Post. Miss Channel is a pretty young lady, and a Kansas girl, having been born in Topeka. 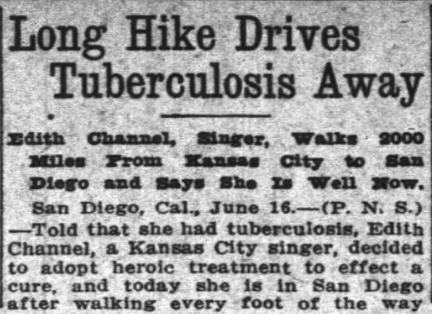 This winter physicians told her she would have to go west and leave Kansas City or she would be liable to contract tuberculosis so she gave up the stenographic job and decided to go to California. […] She started February 24 and spent ten days visiting a brother in Topeka. The longest walk she has made in one day has been about 15 miles and she has hardly got used to the matter of walking yet but is making a little better time. She left about noon for Pawnee Rock. She carries 14 pounds of luggage and is pretty cheerful over the prospects of the journey. she expects to get to San Francisco in plenty of time to see the fair and was particularly overjoyed here to find out that the roads were much better in the western part of the state than here. She has to make the trip now on the railroad right of way and thinks the trail road will be better to travel on. The Fair in San Francisco was the Panama-Pacific International Exposition. It opened March 2, 1915 and closed on December 4 that year. 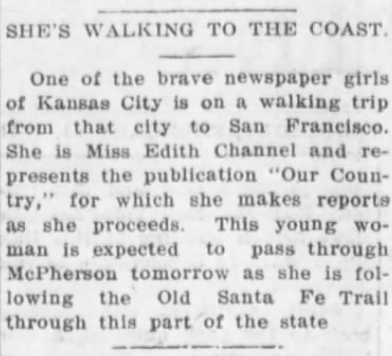 The same day the Great Bend Tribune published its blurb about Edith’s journey, the Barton County, Kansas Democrat published an article of its own. The Democrat stated that Edith was “rather small, and dresses in a walking suit of khaki, and says that except for the fact that her muscles were a little sore from the effect of her unusual exercise she feels none the worse for her experience. On July 21, 1915, The Santa Cruz Evening News published a photo of Edith Channel and a traveling companion, Olive Louise Woodward. A few days later, on July 24, 1915, the Fort Wayne, Indiana Sentinel published the same photo of Edith and her companion. The accompanying article was simply a longer version of the one published in the Santa Cruz paper. The girls were planning on 15 to 20 miles a day. Edith there explained to the head physician that her father and grandfather had died from the disease. 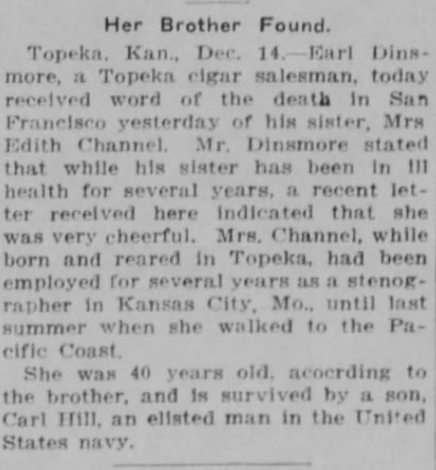 Independence Kansas Daily Reporter, 12/14/1915. Edith’s age was given in articles as 23 and 25. The US Federal Census from 1900 listed a 23-year-old Earl Dinsmore living with an Edith and Lester Channel, both 24. A Kansas State Census taken in March 1905 shows a 29-year-old Edith Channel living Lincoln, Kansas with a J.J. Channel and a boy of 12, Carl Hill. The next Federal Census 5 years later finds an Edith aged 34 living in Pennsylvania with a Chester Channel. It seems likely Edith really was 39 or 40 when she died, rather than the ages she gave to various newspaper reporters along her journey west. 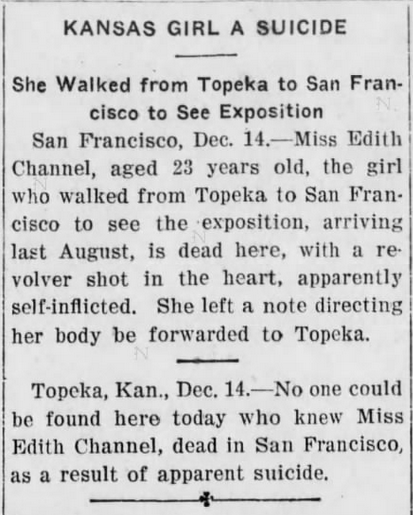 Some articles about her suicide stated she had been employed by the Panama-Pacific International Exposition, which closed just before she died. The lies and secrets Edith kept as she carried her pack across the west in the last year of her life don’t matter now. She was a singer; sure. A writer–okay. A photographer? Whatever. Finding the first trace of her journey in those old papers, addled, distracted and pressured reporters haphazardly gathering the bits of her story on the way–that long-distance view was too compelling to not trace. Like piloting a time-traveling drone quietly buzzing above her head as she strode the tracks and the roads. The vast buzzsaw of the Great War was sweeping a continent an ocean away, and soon enough, America would join the fight. Anarchists and spies were setting bombs up and down the East Coast. Inventors and innovators were flourishing. In Kansas, a woman decided to make a new younger self. She might have just been a liar. But maybe she saw that she still looked young and saw an opportunity to grab something before it faded away. Even if she didn’t have tuberculosis–the white plague–when she arrived at the Exposition, even if that was another fiction, it no longer matters. She packed her curling iron, cold cream, a lamp, and a gun. She set out on the Santa Fe Trail. She had a purpose, that much is clear. She must have found something she needed on her walk. It might have been her English friend Olive. It might have been the moments of fame in the papers, always a few pages back from the war reports. Of course, it didn’t fix whatever was broken within. And Edith seems to have been forgotten outside the microfilm machines scanning papers across the years, the scanners digitizing those images. 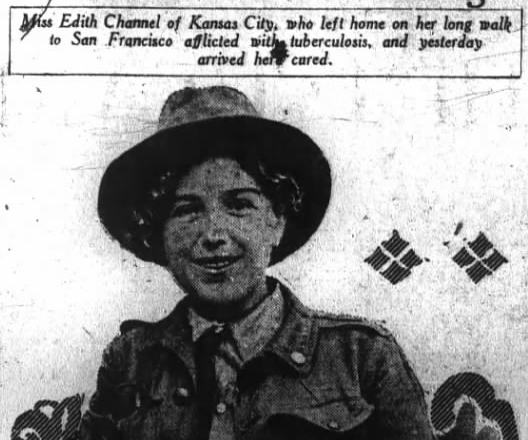 I don’t truly know why Edith Channel made her journey. But across 100 years I can see her, a ghost in khaki with her soft hat and her pack, under the hard stars and those great skies out west that terrify, and awe. I don’t want her to stop walking. Someone I would like to have known. I think I would have too. I guess back then it was easy enough to assume a new age, even a new identity. In the long run I wonder what the walk was indeed meant to accomplish. If it was fame, then however small or fleeting, her mission was accomplished. This reminded me of a book, The Unlikely Pilgrimage Of Harold fry. An old man walking 600 miles just to deliver a letter himself. Going by the last photo of hers, she just looks adventurous. She well could have been a travel blogger here on WordPress. Great piece of history/writing. Thank you! This is a very cool story. Sometimes the journey doesn’t need a reason or a why, it’s just about the journey. And I guess, when she stopped walking, she lost the motivation to keep going. So very well written. Thanks for sharing this most interesting Story. Great piece of writing as a fiction writer this definitely gets my imagination into overdrive! That’s incredible- how did you even know to look for this? I guess we all at some point (and more likely this point is middle age) want the chance to reinvent ourselves, even if only temporarily. She mentioned she wanted to be in the movies- perhaps the disappointment if rejection drove her to despair. She should have kept on walking. There was no need to run. It was pure chance. I often scan old online images of newspapers and the photo of Edith and her companion grabbed my attention. I read the brief article and just wanted to know more. When I got to the last articles after she reached her destination I was blown away and had to write about it. I’m so glad you took the time to research and write this then— really enjoyed reading about Edith and set me thinking about there really being nothing new under the sun. People then, people now, different circumstances, same hopes, dreams, delusions and disappointments.